In addition to biographical files on Ohio authors, the Ohioana Library’s collection includes manuscripts, artwork, correspondence, and more. 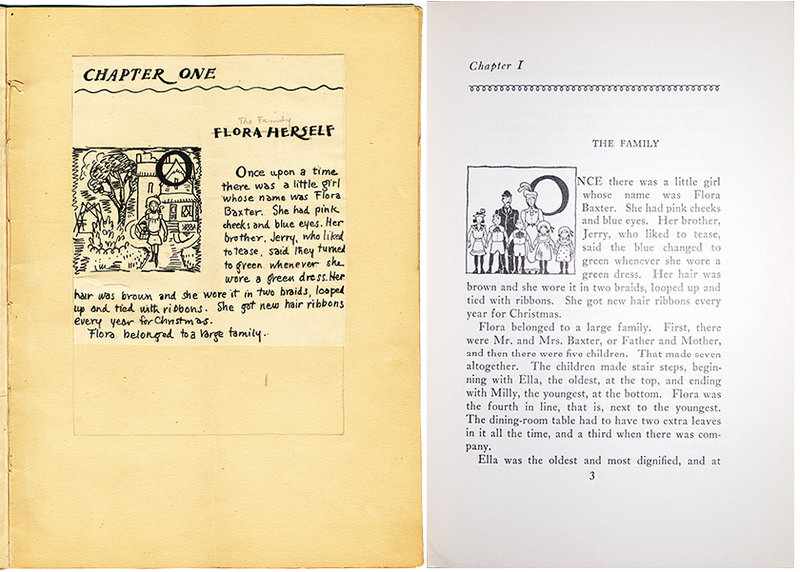 To celebrate the last day of National Archives Month, we’re highlighting some items from our Lois Lenski collection. Lenski was born in 1893 in Springfield, Ohio, but soon moved to the small community of Anna. She was a voracious reader throughout her childhood. After graduating from Ohio State University, she studied at the Art Students’ League in New York and the Westminster School of Art in London, England. She began her literary career by illustrating the works of other writers such as Hugh Lofting (author of Doctor Dolittle) and Maud Hart Lovelace (author of the Betsy-Tacy books). The first two books that Lenski wrote herself–Skipping Village in 1927 and A Little Girl of Nineteen Hundred in 1928–were based on her own childhood in Ohio. Lenski went on to write numerous historical and regional novels for young people, and won the Newbery Award for Strawberry Girl in 1946. She died in 1974 at the age of 80. In the 1930s Lenski began to donate original artwork and other items to libraries, where they would be available to the public. 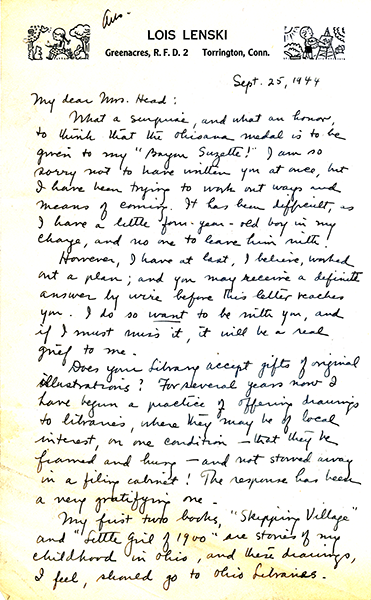 The letter above was written in 1944 to the director of the Ohioana Library, offering to donate pieces from her first two books. The images below show some of these items. The image below left shows an interior page from the mock-up, including edits handwritten in pencil. At right is the same page from Ohioana’s collection copy.